Microservices is a synonym for Service Oriented Architectural (SOA) style of constructing aggregation of many small loosely coupled services. When developing microservices with java, you can use several microservices framework. Some of the frameworks are Spring Boot, Jersey, Dropwizard, Play Framework, and Restlet. In this document, we will implement a microservice “authenticate” with Spring Boot. Spring Boot is the best and most used Microservice framework since long. Here, we are going to create 3 different microservices. 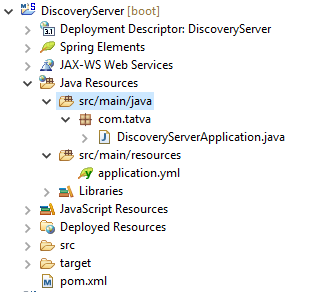 First microservice is Discovery Server which is a Eureka server. Second microservice is Authentication Service which is Producer service and Third microservice is Consumer service which is discovery client. This microservice can find other microservices using its RestTemplate. Let’s start with developing these three microservices. 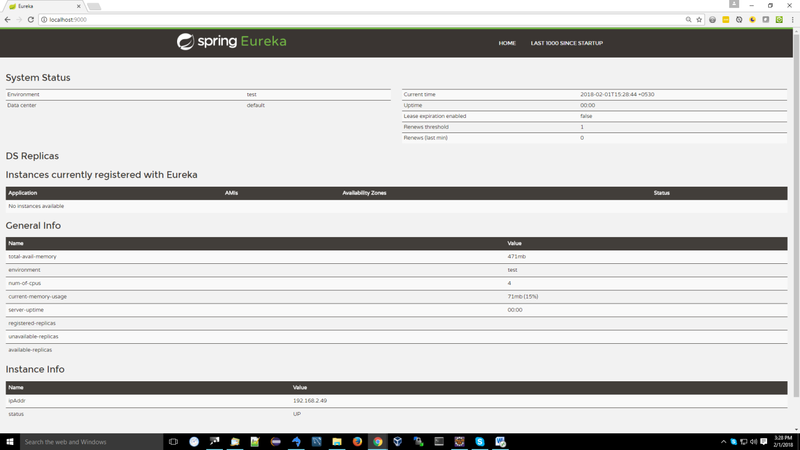 To run Eureka registry service is easy, just define @EnableEurekaServer annotation to spring boot application. After running this microservice, following output is available on localhost:9000: Here in the application section of the image, there is no instance currently available with Eureka. After running Producer and Consumer microservice, we will able to see the instances in the Application section. To define this microservice as Discovery Client, we need to include @EnableDiscoveryClient annotation to application. 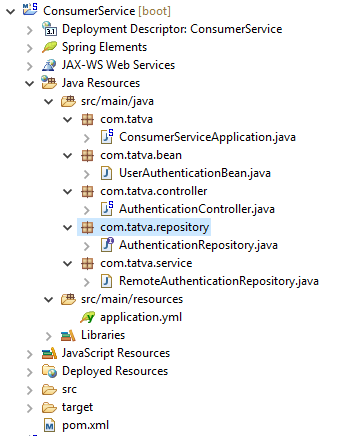 We will create AuthenticationRepository to querying the database using JPA. 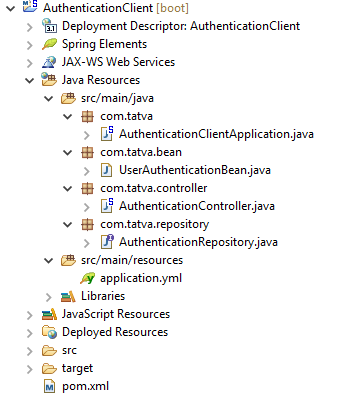 To expose Authentication service, we use RestController. In the controller, @CrossOrigin annotation is used to pass data or get data from cross platforms like Angular. After running this microservice, you can fire rest call to this service on localhost:9001. 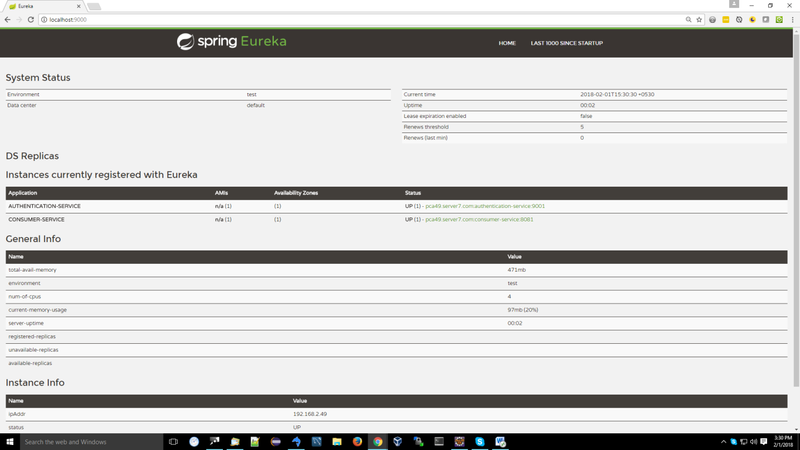 Also, instance of this service gets registered in eureka server which is already running on localhost:9000. You need to include RemoteRepository bean and RestTemplate bean in main application, so that this microservice can consume other microservices. RemoteRepository will pass the HTTP request to the given Service URL and get the response from the remote service.